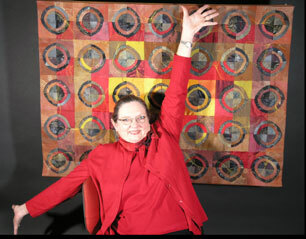 Welcome to the website for Rebel Quilter Susan Leslie Lumsden. What makes me a rebel? It is seen in my playful approach to color, materials and techniques. I often break “rules” that I find meaningless and I tend to work in my own color palettes. To accomplish this I usually work in silks and dye them myself. Using hand-dyed silks, high quality cottons and various mongrel fabrics, such as glistening metallics, my assemblages are layered and quilted using the tricky technique of freehand, freemotion machine quilting. The bulls-eye motif has become the foundation for most of my work—a universal symbol that is perfect for corporate, hospitality, public, healthcare and residential environments. The colors I am drawn to are saturated and rich—seldom the combinations found in traditional quilts. My signature style has won many awards in fiber art exhibitions, multimedia exhibitions, as well as fine art festivals throughout the nation. How do I do it? My blocks begin as squares with a circle appliqué in the center. I “rob Peter to pay Paul” to build up the layers—scrambling each layer. Then I quarter the blocks and scramble again. These blends of color—truly an homogenization—lend themselves to an exploration of dynamic quilting. The quilting may reveal am image or motif that has a personal relationship to the owner. Whether creating a large-scale work for a very public space or a small piece for a very private one, my approach is one of play and insouciance. Even subjects as intense as racism and child abuse are approached with a light heart and an attempt to get people involved and talking. I create interest by interplaying multiple textures—matte, rough, suede-like, smooth, shiny, slick, or luminescent—with colors that when combined create resonances. Often I’ll incorporate mongrel fabrics that have their own special qualities to enhance that resonance. Of late, I’ve also played more on the backside. When I dye the back I am presented with a nice large canvas that inspires me to dabble with the various surface-design techniques in my toolbox. More and more I am creating stamps, silk-screens and linocuts that restate the journey begun on the face of the quilt. Another aspect of my journey is the quilting itself—the stitching which joins the quilt face, the batting and the quilt back. I find I am electing to create a motif that at first glance just catches your eye, then, draws you in for a closer look. Upon the tighter viewing you’ll see the motif again replicates the theme—perhaps taking you to journey’s end. My recent work continues my exploration of color relationships—seeing how color families communicate with each other is a constant, tantalizing education. When the colors begin to speak or sizzle I just let them go. What comes next always keeps me entertained. The use of the bulls-eye block—an old traditional quilt block—creates its own level of serendipity. There is always an element of surprise. That is my addiction—the surprise. My techniques are sound and created in such a way as to last for generations. By focusing primarily on working with silk I am constantly reminded of its rich history. Here I am thousands of years later with the privilege of taking what was already a luxurious fabric and manipulating its color and shape to create luscious color journeys. Silk, unless exposed to excessive amounts of direct light or harsh chemicals, has a history of lasting hundreds of years. I am just as content to work in a collaborative environment or on my own. Let’s see what I can do for you! Website designed, hosted and copyright © 2005 Massage on the Web. Artwork and articles copyright © 2005 Susan Lumsden.